The Oblates bring the richness of their tradition and the charism of St Eugene de Mazenod, to their ministry. Iona is blessed with the ministry of the Missionary Oblates of Mary Immaculate. Faith is the very essence of the life of Iona. 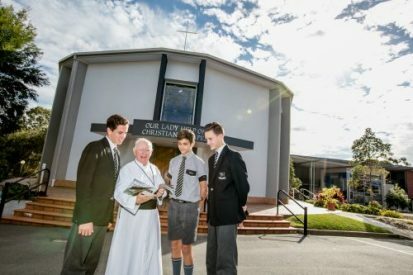 Faith development and expression are integral to our identity as a Catholic College operating under the mandate of the Archbishop of Brisbane. At the heart of our ethos is a deep respect for life and a total belief in the dignity and value of all people because they are children of a loving God. This is lived out through the pastoral care of the students, staff and parents who together form the Iona family, and through our compassion for those in our society who are less fortunate than we are. The presence of Oblate priests on campus and our own Chapel enhances the opportunities for the spiritual development of our students and staff. Quiet moments with God are encouraged – vital in a world that moves at such a frenetic pace. Through our college masses, liturgies, classroom prayer and meditation, as well as the spiritual component of our camps, the boys are given the opportunity to sit quietly with their God and reflect on their lives.